Dated April 1, 1945 (Easter Sunday); postmarked April 2, 1945. 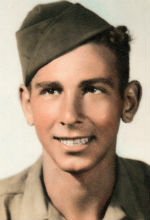 The photo is Babe’s Combat Infantryman Badge. Yesterday I received a whole batch of mail that was following me around. One of them was from Vince, from Brooklyn. I answered it today. The “Stars and Stripes” I sent you were only to let you know what kind of paper we had. There was nothing in particular I wanted you to see in any of them. The badge is the Combat Infantryman’s Badge. I received Bib’s letter from Albany and also his Hi-Y picture. I am back with my outfit now, so I will be able to send you the things I said I’d send. Naturally, I couldn’t send them from the hospital because I didn’t have them. You can send me more pictures of all anytime you get around to it. Also send me a package and if you don’t think they will perish, send me some of those nickle pies. Also some razor blades; Gillette. I received the address of Monnemaker and I shall probably see him within the next week.